Well i want wish a happy belated imeniny (name day)! you didn't know what i was making and i made it especially for you <------ same as your comment kashi but fixed LOL. This wall nearly made me wanna slit my wrists due to the pigeons (100% vectored) and the overall girlyness of it, i think I've got in touch with my feminine side. All the elements in this wall are vectored with a photo manipulated BG and render effects. I've done 5 BG's and i think this one worked best due to the deep blue and white complimenting the bright colors nicely. Overall i was going for a peaceful look that in some way incorporated wisdom (meaning of the name Zofia) and by that i'll let your imagination think of what it was. "hint: the song title" i know you like this song kashi. Song: "Fallout Boy - Hum Hallelujah" from infinity on high album. The clouds need some painting make-over. And I think the vector stands out too much from the rest of the background. But nonetheless, clean and fresh vector! the backgorund and the doves looks great! 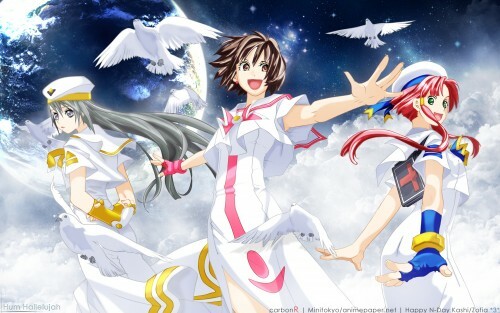 TIME PARADOX having young Aika with Akari and Alice.